wassupbollywood: Raaz 3 inspired from Vikram - Ameesha's life? Producer Mahesh Bhatt while unveiling the first trailer of Vikram Bhatt's Raaz 3D outspokenly described the film as a mix of three real life stories - that of Bipasha Basu, writer Shagufta Rafique and director Vikram Bhatt. In fact he went ahead hinting that Bipasha's character in the film is based on one of Vikram's ex-girlfriend (probably Ameesha Patel). 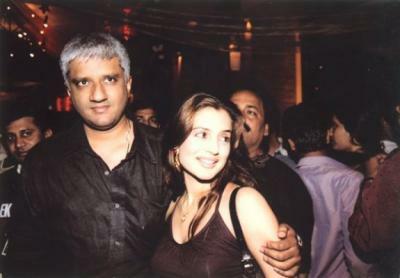 When we asked Vikram Bhatt about Raaz 3 portraying his relationship with Ameesha, initially he quipped, "My real life is more dramatic than my film Raaz 3D. I have lived a very dramatic life." But later on got candid about his past relationships and how he could derive things from his personal experiences, "I have been in relationship with two actresses. I have lived with them closely. See, however beautiful a woman may be she gets angry, insecure and she has her own fears, after all they are human beings. I have had the fortune (or misfortune whatever) of seeing very glamourous & beautiful women from close by. I have witnessed their fears, insecurities. So, when I was making this film where Emraan plays the character, who is caught between two superstar females, I could bring something to the film that nobody else could because I have seen this in my life. It's something that I have been up, close and personal with. I could bring something so real on-screen." Though Vikram neither accepted nor denied about Raaz 3D being inspired from Ameesha's chapter in his life, he unequivocally talked about his ex-flame and even disclosed what really went wrong between the duo. Vikram says, "Both Ameesha and I saw bad times together. But when the good times came unfortunately we were not together. I was having my string of flops and she was also struggling. And as luck would have it we broke off just before 1920. Thereafter all the hits like Shaapit, Haunted, et al came back-to-back. I have seen her struggle. The girl who came with Kaho Naa Pyaar Hai and Gadar and arrived at top with good films like Humraaz, etc. But then she saw other girls taking her over. I also saw other directors coming and overtake me. So we both went through difficult times. And that's the reason I understand the pain of an actress who is losing her ground and that comes with what I have seen. "I have seen her being so excited doing good work. I remember when Thoda Pyaar Thoda Magic was about to release, Ameesha had pinned all her hopes on the film. I have seen the pain of failure up close and personal. I have these memories of a girl who was fighting hard to bring back the time that had gone and I too was having my combats with the bad phase. So it's not just about her it's also about me. But, luckily I was able to re-invent myself because I am a director, who doesn't have a shelf life. But that is not the case with an actress as beauty has a shelf life. And that is unfortunate part for any actor," he adds. And now that the beautiful actress has moved on in her life and all geared up for her own production Company, Vikram, without holding any grudges, shows a mature behavior and wishes all the luck to her. "I wish her all the luck in her endeavour. I hope everything works for her and goes well because I have seen her go through a lot in terms of her parents, her case, etc. Everything came to her at one time. It was unfortunate!," says Vikram Bhatt on a concluding note.